With the recent Student protests in Taiwan reached to a breaking point where the Students occupied the Legislative Yuan and Executive Yuan, it seems that the Cross-Strait Service Trade Agreement (CSSTA) might be open for renegotiation or disband it in its entirety. While it is within their right for the student to protest against the government about this Trade Agreement, but is it in their best interest to do so? The bigger question is if the student protesters don’t want to be ‘annexed’ by China, are they in danger of trade isolation because of protectionism in their country? In 2010, China and Taiwan have agreed on the ECFA (Economic Cooperation Framework Agreement) and has brought a lot of benefit to Taiwan. It has allowed many companies for cheaper exports to China and Taiwanese companies to set up presence in China, but there are consequences to this trade agreement. This means that if a talented Taiwanese wanted a prospect for a decent job they will have to move in China to work, which cause this kind of brain drain away from Taiwan. Also, Taiwan have put much restrictions on Chinese citizens to allow them to work in Taiwan so Chinese companies are not as willing to set up presence in Taiwan. Morever, even with the ECFA signed, it still needs more FTA’s with other countries, namely to compete countries like Japan and South Korea which already have global Conglomerates which Taiwan does not have. China is already following South Korea and Japan’s lead in developing giant companies and set up presence in many 3rd world countries, but faces many restrictions in Western Countries like in Huawei’s case. In CSSTA, it allows Taiwanese companies to start setting up presence in China and in doing so, they can go global. However, CSSTA must go the other way and allow less restrictions for Chinese companies to set up presence in Taiwan. My fear is that if CSSTA is not passed, Taiwanese companies would be even less competitive and many of these Taiwanese companies would simply wither away leaving Taiwan dependent on Western Companies to set up their presence in Taiwan. This is what is happening in many of the ASEAN countries like Vietnam, Malaysia, Indonesia, Thailand and the Philippines. Even worse, if the radical right in Taiwan decides to cut off ties with China would be bad for China and worse for Taiwan. I am afraid that this may not be about trade per se. Yes it is superficially about trade, but I think it is really more about the unpredictable and still turbulent waters of politics of unification in Taiwan. The real undercurrent that is driving the protests – and I may be wrong – is the lack of consensus (there are strong opinions), but I am talking about general consensus that is palpable) on the politics toward unification – or independence if you want to look at it another way. Trade is simply the excuse for the protest. It is hijacked by the unsettled undercurrents. By the way, unsettled undercurrents doesn’t mean that Taiwanse generally don’t like unification. On the contrary. I think most would – when the time is ripe (and it will inevitably ripen. But as long as there is a vocal committed minority to independence and never unification, the path to unification will be unsettled. Heck, given how research has shown that a committed 10% will always set agenda – see e.g. this article, I have been surprised that the majority of Taiwanese have not tilted for pro-independence. I would agree with you it’s more about unification/independence than with trade. China has been favoring Taiwan in trade agreement to curry favor with the people of Taiwan. The fortune of those students protesting would have a better future associating with China than as an independent state against the rising China. Most people in Taiwan would prefer status quo, but giving the pro-independence party not rising above 50%, expect more commotion in the future. Agreed, China has made many concessions in terms of agreements with Taiwan in the ECFA and the CSSTA. Somehow the protesters don’t understand that they are biting the hands that feeds them. I imagine that the DPP will come to power and start poking at China again. China then will withdraw some benefits from the ECFA and the KMT and the DPP will fight each other again. Funny thing is that this kind of tactic of the minority DPP trying to stonewall a legislation is not unusual. Last August 40 DPP lawmakers barricaded themselves in the Legislative Yuan over an approval to build a nuclear plant. Students occupying the Legislative Yuan is certainly illegal and the student leader Lin Fei-Fan demanding President Ma to make concessions in order to have talks with them is anything but democratic. 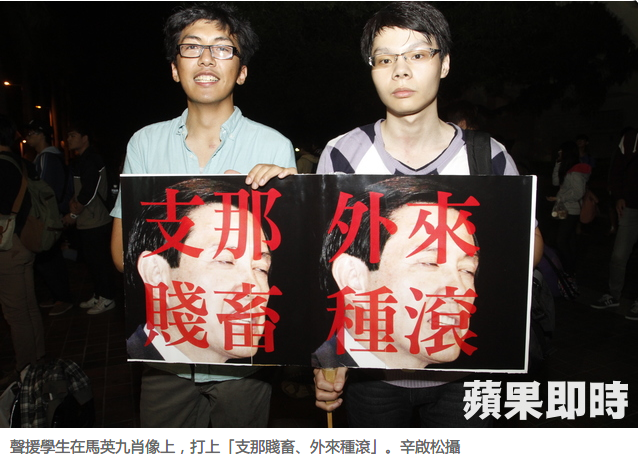 While people in Taiwan tout that they are a democratic, it sounds anything but democratic.